« UCG: Can the Dollar Fall? On one occasion, when Jesus spoke of His impending death, “Peter took Him aside and began to rebuke Him. But when He had turned around and looked at His disciples, He rebuked Peter, saying, ‘Get behind Me, Satan! For you are not mindful of the things of God, but the things of men’” (Mark 8:32–33, New King James Version). Jesus saw Satan behind Peter’s response. Thankfully, the apostle had come to understand many things since those days, including the depth of the archenemy’s work of deceiving humans. Peter had also recognized that Jesus is the living foundation stone for the house God is building from specially called and chosen human beings (1 Peter 2:4–5). But I want to go into this is a bit more depth than David Hulme did as that article did not quote the verse or go into more detail. As most know, the Church of Rome claims that Jesus made the Apostle Peter the foundational stone of the church based upon a misunderstanding of Matthew 16:18. 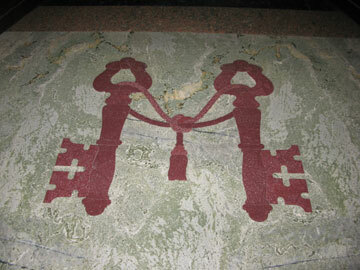 They also teach that they have the “keys to the kingdom” which is why they have the mosaic of keys at the entrance of Saint Peter’s Basilica in the Vatican (shown at the beginning of this post). Jesus also referred to Himself as the chief cornerstone in the Gospels (Matthew 21:42; Mark 12:10; Luke 20:17). Since Jesus and Peter knew that it was Jesus, and not Peter, who was the rock, the chief cornerstone, of the Church, that is what all need to realize today. The Apostle Peter He was an original apostle and early Christian leader. This entry was posted on Monday, June 22nd, 2009 at 6:10 am	and is filed under COG News, Doctrine.